We have got confirmation regarding the absence of this version of Nendoroid Petit Yune in the last WonFes, after being shown along with the other three Petits at the Japan Expo. Well, it turned out that she will be an exclusive product, or specifically a mail-in order, and bundled with Ikoku Meiro no Croisee TV Anime guidebook. The Petit itself will include two exchangable bodies, an optional hair parts, as well as a French bread. The whole set is priced at 2000 Yen and scheduled for March 2012 release. If I guess it correctly (I cannot read Japanese after all XD) the closing date for the pre-order is October 7. 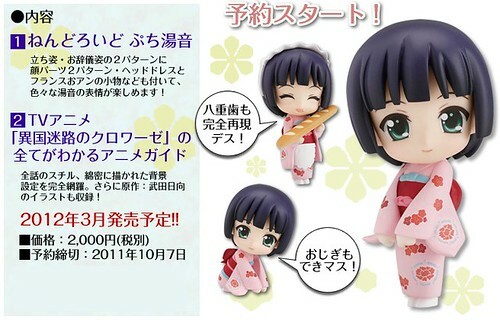 This entry was posted in News and tagged bundle, ikoku meiro no croisee, nendoroid, petit, puchi, yune. Here I was, hoping for a normal set release, then this happens. it is expensive for just a Nendoroid Petit ? Am I the only ont find it expensive… and we have to add a proxy cost as well ! 2000 yen is for set of Petit Yune and Artbook to anime.